Iowa State University’s Robert C. Brown thinks his new fast pyrolysis of lignocelluslosic biomass has the potential to be the cheapest way to produce biofuels or biorenewable chemicals. The competition is on – a post on sugar was up just two days ago on a private venture firm backed technology. 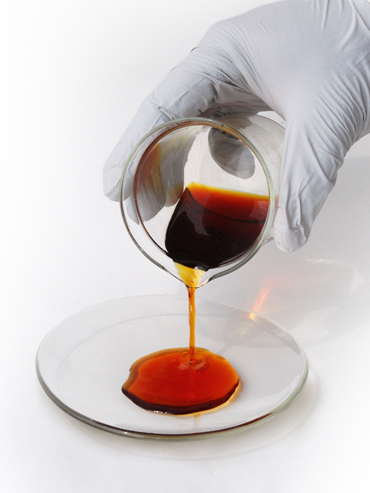 Iowa State's Pyrolytic Molasses Sample. Click iamge for more info. Brown is definitely credible on this; he’s an Anson Marston Distinguished Professor in Engineering, the Gary and Donna Hoover Chair in Mechanical Engineering and the Iowa Farm Bureau Director of Iowa State’s Bioeconomy Institute. Brown and Iowa State researchers presented their ideas and findings during tcbiomass2011, the International Conference on Thermochemical Conversion Science in Chicago Sept. 28-30. Brown also said Iowa State literally took a busload of students and researchers to the Chicago conference to present their work on thermochemical technologies, including production of sugars from biomass. On Thursday, Sept 29. Brown addressed the conference with a plenary talk describing how large amounts of sugars can be produced from biomass by a simple pretreatment before pyrolysis. He also explained how these sugars can be economically recovered from the products of pyrolysis. Hold on to your anti Big Oil seat – The work has been supported by the eight-year, $22.5 million ConocoPhillips Biofuels Program at Iowa State launched in April 2007. One might think Big Oil is more serious about biofuels than people in the mass media are aware. The basics of the sugar rush is the sugars can be further processed into biofuels. Brown and other Iowa State researchers believe pyrolysis of lignocelluslosic biomass has the potential to be the cheapest way to produce biofuels or biorenewable chemicals. The fast pyrolysis of biomass applies to Iowa’s vast supply of corn stalks or wood chips. Fast pyrolysis involves quickly heating the biomass without oxygen to produce liquid or gas products. · separate sugars from the heavy fractions of bio-oil using a simple water-washing process. Note to the Iowa State folks – We’d really like to see and hear the presentation and slides. We might want to get used to the idea that a chunk of the transport fuel market is going to be alcohols and synthetic fuels. One, or several of these biomass to sugar methods is going to come in way cheap and set off a new order of fuel market contents. Its great to see that Big Oil, and an American leading firm like ConocoPhillips backing this up. The prospect for pyrolysis to go to commercial scale is probable – maybe even inevitable. Maybe Big Oil is further along in alternative fuels than we think. I can think of 2 further lines of action for fast progress. 1. Use of thermo-chemical process (not bio-chemical) for further conversion to fuels. 2. Use of an MSR as the heat source fur initial dissociation of bio-mass. The biomass slurry can be just pumped through at required speed, temperature and pressure. I still cannot help but believe this will eventually be more important as a food or feed stock than as fuel.